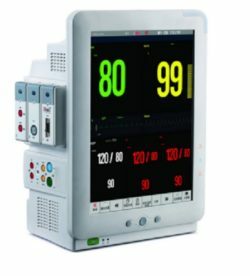 The Me7 is a modular patient monitor with a 15″ touchscreen. With its streamlined design, user-friendly interface and integrated plug-and-play module rack the Me7 meets all modern requirements of an operating room or intensive care unit. In standard configuration the Me7 comes with 3/5-lead ECG, RESP, SpO2, PR, 2x Temp, 2x IBP and NIBP. Available options are: 12-lead ECG, sidestream/mainstream/microstream EtCO2, sidestream/mainstream AG, Masimo/Nellcor SpO2, 2x Temp, 2x IBP and cardiac output. A 3-channel thermal recorder is also available. 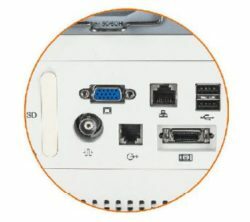 The optional plug-and-play modules are easy to connect and disconnect thanks to the user-friendly click system. This allows you to tailor the capabilities of the Me7 patient monitor to your specific clinical environment. The modules can also be shared between different beds or departments, which can help increase the hospital’s cost-effectiveness. 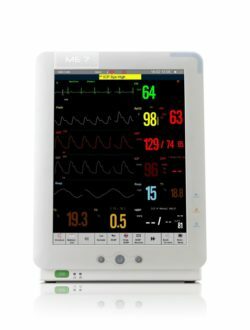 The Me7 is equipped with a wide range of slots and outputs: an SD-cart slot, a VGA output, an ethernet slot, 2 USB slots, a defib sync slot, a nurse call output and an extension slot for an additional external module rack. Optionally a wifi connection to a central monitoring system is also available. The Me7’s intuitive user interface allows easy access to all parameters. Thanks to the sensitive 15″ touchscreen no rotary knob is necessary. A set of easily accessible quick keys can also be preconfigured to your personal preference.